I took my first stab at making Indian food just a few days ago. I was late to the Indian-food-love overall. I had my first taste around the age of 27. Why I waited so long, I’ll never know. But I do know now that I indeed love Indian food. After my love-at-first-taste experience with Indian food, I enjoyed eating it frequently. However, I dared not try making it on my own. Indian food seemed to me to be this exotic and impossible-to-reproduce food masterpiece. I thought it was best ordered at an authentic restaurant. But at the coaxing of one of my Indian friends, I finally gave her recipe a try. It was for one of my favorites – Chana Masala! Indeed, it was delicious and wonderful. But, the best part was that it was incredibly simple to make. Or is the best part how insanely affordable this vegetarian dish is? Either way…Hazzah! 🙂 And did I mention how much my meat-eating husband loves this? Yes, a vegetarian…no vegan…recipe that even carnivores will love. I adapted my friend Yamini’s recipe to share it with you guys! Talk about a 30 minute meal you’ll want to make ASAP. This easy recipe comes together in a cinch and uses few ingredients (but ok, lots of spices). It’s also easy on the wallet. This recipe boasts an amazing and unique flavor. Chana Masala makes for a great vegetarian main course or side dish. Serve with rice and/or homemade naan. Yes, homemade is simple and really completes the meal). See Notes below for another naan option. Pre-heat a medium sauce pan to medium heat. Add oil to pan. Add onion and cook until onion is translucent and just browning, about 5-6 minutes. Add garlic and cook for one minute, or until garlic is fragrant. Stir in coriander, cumin, cayenne, turmeric, and salt. Stir in water and tomatoes and cook until tomatoes are soft, stirring occasionally, about 5-6 minutes. Using an immersion blender (or stand blender), blend tomato mixture until blended well. Add extra water, if needed. Add chick peas to tomato mixture and stir to combine. Bring mixture to a boil and then reduce heat to simmer. Stir in garam masala and additional salt or pepper, to taste, if needed. Simmer chick peas and sauce for 10 minutes. 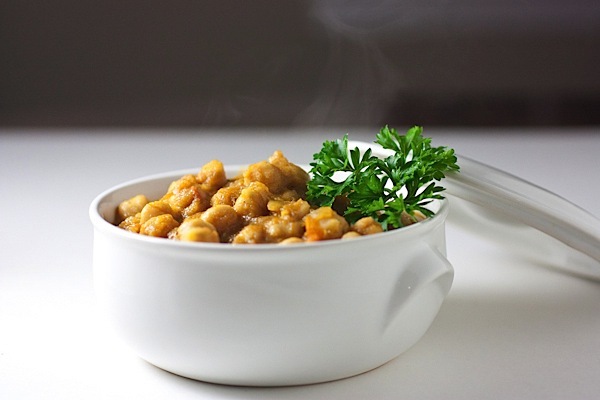 Serve chana masala with rice and/or naan. Serves: 4. But even if you’re only feeding less, make the whole batch. This makes for wonderful leftovers that re-heat great the next day. If you have the time, homemade naan can’t be beaten. But, if you need a hand, Trader Joe’s has great frozen naan. It’s available in two flavors: tandoori and garlic. And, it heats up in only 1 1/2 minutes in the oven. Not too shabby, TJs! How old were you when you tried your first Indian food? I’ve only been cooking Indian food for a few months, but I’ve been loving it since I was 13! It really is a lot simpler than I anticipated, and you honestly only need to get a bunch of spices before you’re good to go. I didnt try Indian food until I was in college- maybe 21 years old! I have never tried to cook it at home though! I can just pull back on the spices a bit if you think it will be too hot for them. 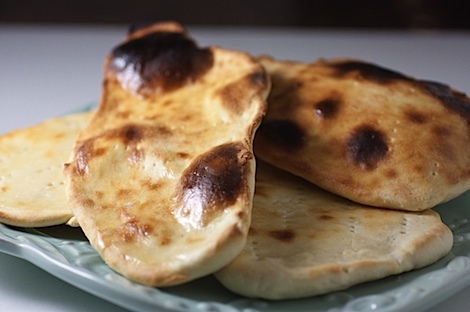 Totally grabbinh naan at TJ’s tonight and making this over the weekend! I thought it was spicy in a flavor-way (not burns-your-tongue-spicy), but I bet you could cut the spices, like you said. Hope they like it! 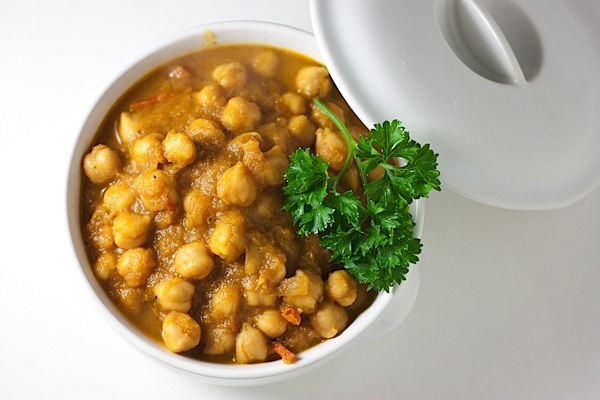 I adore Chana Masala – it is one my favorite recipes! I actually made tried Indian food and made it for the first time last year! I was instantly hooked! Thanks for the recipe, I’m going to make this tonight! I have been stockpiling tins of chickpeas for way too long so time to use them up!! I didn’t try it until I was 29 (ack! ), but love it now! What a delightful dish! I tried it tonight (including the naan) and it was a home run! Thanks for tasking the time to put this one out here for everyone to try. This is a great blog. I will check it out again. I love Indian food, and yet have always been intimidated to cook it because of it’s seemingly complex flavor profiles. I had all but given up hope on making my own chana masala, until I stumbled upon your site . . . This is it: the perfect recipe that is easy to make and tastes like it came straight from an authentic Indian restaurant. My intimidation has instead become enthusiasm, and my craving has thus been sated. I followed this recipe step by step until the end; rather than leave them whole, I mashed the chick peas to expose the peas to the full-flavors. I then allowed the chana masala to sit for about an hour before reheating and eating it over a bed of organic quinoa. Absolute perfection. Perhaps next time I’ll make some vegan naan to accompany it. Thank you for helping me conquer what I thought was once impossible. Thanks, Diana! I look forward to making more of your vegan recipes. We were recently in Sunnyvale,CA and had THE BEST EVER Channa Masala at “The Spice Hut”. My family adores Indian food but I’m a relative newbie making it. I vowed to try,try and try again to find a recipe to replicate the one from “The Spice Hut”. I had tried a few Channa Masala recipes in the past but they didn’t cut it. This recipe is SUPERB. We love it! Thank you so much for making my search so very easy. It rocks! Hi Janet, I’m so happy to hear that this recipe fit what you were looking for! 🙂 If I’m ever in Sunnyvale, I’ll have to check out the Spice Hut. It sounds like a great restaurant. Thank you for sharing this recipe. I am actually writing about myths about Indian food and would love to share this article if you don’t mind. P.S. I just started liking corgis since my best friend has one. I was afraid of dogs for so many years! Hi Maerong, Yay for corgi love! 🙂 Please email me at thechiclife at gmail dot com to discuss your ideas. Thanks! I was raised on Indian food…while most children were obediently eating their porridge, I was eating daal and rice! I have never made it though…my Ma makes the best and I fully admit that I am spoilt!! However I will be giving this a try. If its a success, maybe I will make dinner for my parents! Just made this exactly as described. I’m a little torn, because it’s easy and does taste awesome. Just doesn’t taste like the chana masala from my favorite Indian place. (More tomato/acid maybe?) Ah well, thank a lot for posting this as it really is tasty! Hi Steve! Glad to hear you enjoyed the recipe, even though it wasn’t exactly what you were hoping for. I encourage you to keep tinkering with the recipe until you can get it to taste like your favorite Indian place. That’s one of my favorite things to do with recipes! Happy cooking! 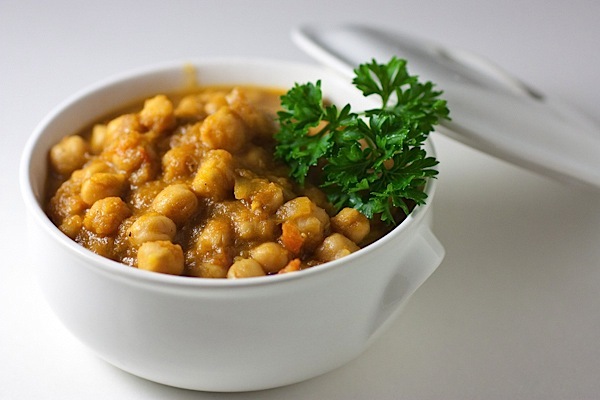 I just wanted to thank you for posting your Chana Masala Recipe. I love Chana Masala and I was craving it tonight but have never made it. I will try this recipe tonight, as I’m definitely looking forward to it. Hi. My husband is North Indian (Punjab region) where this dish is from and I have made chana masala before but it’s got so many ingredients that it took forever. This is easy and still tastes great although nothing can beat my mother in laws chana masala. It also goes well with rice roti or chapati. Thankyou. Will def be making it again. I was surprised at how good this recipe turned out. It needs plenty of salt but the spices are strong. I had it with white basmati rice and whole-grain naan. 5 stars. Hi Ron, Glad you enjoyed the recipe!